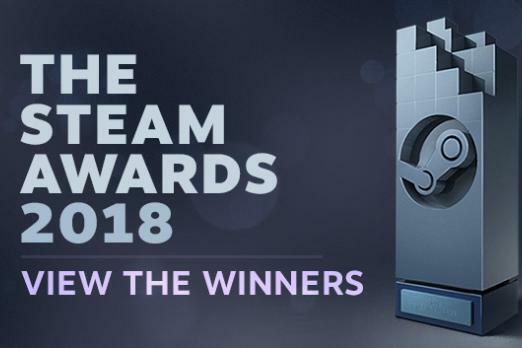 The 2018 Steam Awards are here, with Steam community members voting for their favorite developers, co-op games and the Game of the Year. The full list of award winners can be found below. Many of these categories are fairly straightforward, but a few of the awards need some explanation. The Labor of Love award is for a game that continues to release new content despite not releasing in 2018. The Better With Friends award is for games where you can play with a partner or two. The oddest award has to be the Most Fun with a Machine award, which highlights the games that feature a “car, truck, robot or other mechanized contraption.” Why? I’m not quite sure. For transparency’s sake, Valve also removed themselves from the running for the Best Developer award. Valve runs Steam, and saw their nomination as a potential conflict of interest, and also wanted to use the platform to celebrate other developers. Interestingly, many of the games that won Steam Awards weren’t released in 2018. In fact, the only winner that has a 2018 release date is Assassin’s Creed Odyssey. Of course, the only games that could win awards must be available on Steam, so that eliminated many of the popular Game of the Year candidates from 2018, including Red Dead Redemption 2, God of War and Marvel’s Spider-Man. Another awards ceremony for this year’s batch of games is scheduled for next year. We’ll see if more modern games can make the list of winners. So what do you think? Are you excited to see any of the games listed above win big at this year’s Steam Awards? Did you participate in this year’s voting? Let us know your thoughts in the comments section below.